Cortland is a typical McIntosh style apple variety, and ranks about 12th in terms of US apple production. However nearly all that production takes place in New York State, almost within sight of Cornell University where it was developed in 1898 and introduced in 1915. As with all McIntosh varieties, Cortland is at its best when eaten soon after being picked. The sweet flavour fades quickly, as does the crispness. 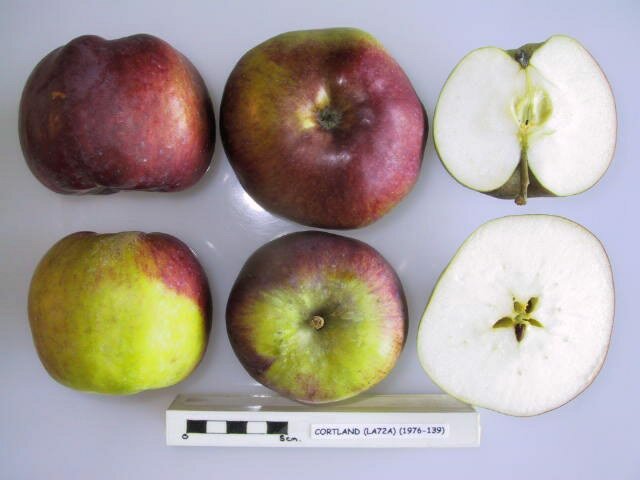 The cut-out photo in our description is of a UK-grown Cortland apple, whereas the other photos are from the USA and Canada, showing how the sunny but cold autumn climate of North America produces a better colour than the cloudy mild climate of the UK. I was told that when my grandfather immigrated from Europe, he thought all the common apple varieties were flavorless. He asked the grocer to recommend one that tasted like a "real apple" and from that point on our family have been courtland fans. As some have pointed out, they vary in flavor. I find that there's a particular round shape that yields the best flavor when I'm picking from a bushel. Overall, great texture (except when they get old), and highly versatile for eating and cooking. To me, it's the perfect sweet-to-tangy balance! Cortland is outstanding. I grew up in the 1960's in Wisconsin and picked and enjoyed hundreds of Cortland. They made the best caramel apples ever and apple pie of course. But I most enjoyed them just by themselves and sometimes with bit of salt! We moved here from Montreal 15 years ago. My favorite baking (pies) apple was Cortland. Even Real Estate agents would say when you would have an open house "bake an apple pie with Cortland" very inviting. However, not a Cortland to be found out in British Columbia (sadly) I have tried Gala, Granny Smith, and a couple of others but not the same texture nor "scent" as a Cortland. I was probably eight when I first tasted this apple, and I loved it quite a bit. Now, I still love it for its quintessential sweetness, with a good bit of tart and perfume and unplaceable taste that ties it together. They have a few problems if you leave them out too long- the flesh is a bit mealy if they get old- but in my opinion, it's well worth the fuss. As Erin Branch of Utah said "An apple that is mediocre at best." A perfect way to describe this apple. I enjoyed eating it, but the apple did not live up to its full potential of quality. The apple was crisp and very similar to the honeycrisp apple that I had last week for lunch. But the cortland apple is similar to my brother that has down syndrome, inferior in every way to the honeycrisp. However, still an acceptable choice of an apple. An apple that was mediocre at best. It was very bland; so much so that I could *taste* the blandness. It was a very odd sensation and almost caused me to spit it out. Oddly enough it was also very mildly tart and mildly sweet at the same time. 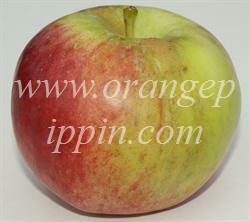 The apple looks beautiful enough, and has a nice firm and crisp texture. But ugh - that flavor; it wasn't *bad* per se, but it was so insipidly bland! My favorite! The ones I buy are from here (Québec) and are sold at a health foods’ store. They are organic, small, firm, crunchy, juicy, a little tart and very sweet. Their skin is a beautiful deep burgundy color, unlike the Cortlands I see at the regular food stores. The flesh is white. If I eat one with my eyes closed, I get a hint of blue grapes and strawberries! The ones I bought this week were stored for at least 4 months before they arrived on the shelves. These apples grow best in colder climate zones (zone 4-5-6). My only wish would be for the tree to be more resistant to diseases. A must have for my back yard. Tastes sweet but I understand the "vinous" description as it does have some overtones of the wine-like flavor, but not as much as Winesap. The best I've seen for keeping it's white color. All purpose. High on my list for baked apples. This is probably one of my favorite apple varieties. I must be spoiled, because they are so easy to get around here, and normally with very good quality as well. This is my FAVORITE apple!!! I use them to to make jelly, pies, apple sauce, cider, fruit leather and all around eating too. I have two trees, and the apples I don't get, my two Labrador Retrievers get. They have a 20ft x 20ft kennel, and wait at the door every day and run right by me to get the latest droppings. The only apple I want!!! Cortland is my favorite apple of all time. I will travel miles just to get a bag of Cortland over any other variety sold at local stores. Our local Cortland was only identified a few short days ago. The apples are incredibly large, tart/sweet, make FABULOUS chunky applesauce. The apples hold their shape well, and I'm excited to try them in pies and strudels. We are seeking advice about pruning this tree to help it generate more fruit. If the size of the trunk is any indication, this is at least an 80 yr old tree. It is a true sentinel. Our apple tree is 50 years old and always bears fruit, but this year was amazing. We harvested almost 500 pounds of fruit from our one tree! Some apples were softball-size, but most were a little bigger than baseballs. It is a descendant of one of the 100-year-old apple trees in a local orchard. Apparently 101 varieties were originally grown there. Bo - Tender flesh with a mild sweet honey flavor and medium mealy texture Brent - A nice cross between sweet and tart. Great apple for mid afternoon treat. Cortlands are so very hard to find. Past couple years, have been available at our local farmer's market. The absolute best apple I have ever tasted. I am spoiled -- wish they were more readily available. If McIntosh can tend toward the mealy, the Cortland I just ate tended toward the hard and a bit fibrous. Tough peel. Flavor is very good though, very reminiscent of McIntosh, but sweeter. Don't often see them in Texas and was glad to try it. Cortland is my favorite apple for everything. But living in Texas it is hard to find. I have only found one store in Austin that carries them and then it is not for very long. Either Oct. or Nov. There is not very many apples grown in Texas. Too hot. They need a cold winter. Lee einerlee@yahoo.com Las Vegas, NM My cortland bore last year for the first time; the flavor was a nice balance of sweet and tart, and the texture was deliciously crisp. My only criticism is that while acidity and sweetness were well balanced and the texture was great, it did not have the complexity of flavor which some apples do. Still, I'm already looking forward to this season's harvest. The perfect apple! Even Oprah, our chihuahua, loves them. Cool, crisp, and not too tart. So good I am trying to grow them myself. Cortland is our favorite apple but is hard to find here in Iowa. The local Wilson's Orchards has just a few Cortland trees so we call frequently in the fall so we can pick when Cortlands are at their peak. My wife loves to eat them crisp & tart while I wait for Cortlands to age into a softer mellow taste. So we have to pick a lot so some can survive the wife to make it to mellow. This is my favorite apple for pie making and for raw apple cake. We had an apple farm nearby where we could buy this variety in Wisconsin, but it is very hard to find here in Missouri. Most supermarkets never carry it in our area, although a few farms have a limited supply. To me, Cortland is the very definition of "apple". Its semi-sweet, juicy, flavorful flesh and versatility has made it my favorite apple for many years. It is great for eating, and for pies, but especially my favorite, for applesauce. I have recently sampled about 15 different varieties of apple in the quest to find the perfect apple for me, but Cortland remains unmatched in flavor and versatility. It is the most appley apple! If I had to complain about Cortland, it would be two things. First, the skin is relatively tough and tastes "green" to me. So I prefer getting rid of the peels, though it's not terrible, just preference maybe. And the other thing is that before too long (a month or two), the flesh becomes mealy and lifeless, even in cold storage. But eat them fresh, or make pies and sauce with them after they age, and it won't matter in the slightest. The best all round, all purpose apple there is. Cortland is very hardy and grows extremely well here in Western, NY. It ripens in mid-September and is sweeter than its cousin, the Macintosh. You can do everything with this apple from fresh eating, pies, cider, sauce, etc. Another advantage is that the flesh does not brown quickly or hardly at all after you slice it. I like it best during the first pickings when the apple is still a little green and has a bit more tart flavor. The Cortland apple is my favorite apple, but it highly depends on when in the season you get them (later seems to be better) and where they come from. I don't pay enough attention to know where and when exactly the best Cortland can be had, but I used to work at a supermarket and sometimes we'd get these giant Cortland apples that were the most delicious apples I've ever tasted. Cortland apples also make great pies, but you have to take care to cook them well enough since they tend to require more time than a traditional Macintosh apple. Cortlands are a very common variety here in Ontario,Canada.Like a Mac, but larger, a bit sweeter & usually more fragrant. They're excellent because they don't brown as quick as most other kinds(fruit plates/dip etc).They keep a bit better than Macs, too, in the cellar & refrigerator.A really nice apple. Pretty good for pies, too,although not as good as Northern Spy. I like to add a Chopped Macintosh Apple to my (Raw, uncooked) Quick Cook Oat Meal, along with Raising and Peanuts, plus Grassfed Org. Cow's Milk. I like the mixed Sweet/tartness and crunchiness of the Macintosh Apples, especially. My local Grocery Store has began carrying these Cortland apples, quite recently--and, since I'm currently Ill, and unable to go shopping, I'm taking advantage of their ishop online Feature. This will essentially keep me from being able to feel, smell, and judge the fruit on my own. Based on my above description, what do you think I may find that is different in Flavor, Crunchiness, or the Balance of Sweet/Tart/Juiciness I've come to appreciate from the Macintoshes, in these Hybrid Cortlands? I'd very much appreciate a quick Answer. Cordially, Clarisse L. Dodge, York, PA, USA PS. Until recently I didn't know that the Apples I liked so, in my breakfast were the Macintoshes, I just bought them, for their lower price than the Red Delicious, which I never knew whether they'd be juicy, sweet and crunchy, or pulpy, dry and tasteless. i was glad to find out the Apples I liked so much were the(lower-cost) Macintoshes. This is lovely apple! Visibly and in flavor it reminds one very much of McIntosh, one of its parents, except that the skin's color is much more uniformly red, and that red is darker. The flesh is bright white, so when sliced into wedges there is an interesting color contrast between the bright white flesh and the dark ruby red skin. In flavor it is akin to McIntosh, but less acidic, and perhaps with a stronger perfume. In my experience Cortland apples are also often larger than McIntosh apples.